Our new CEO, Marvin Carolina has a wealth of business expertise as a successful executive and former entrepreneur, and he was also a Division 1 collegiate athlete. That's a valuable skill set working on behalf of the Better Business Bureau and our accredited businesses. 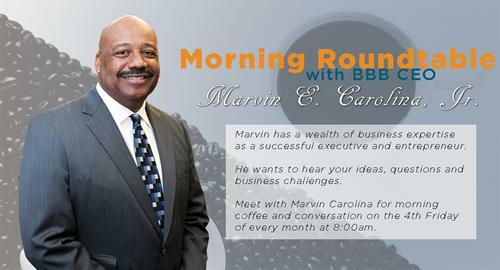 Feel free to send your ideas, questions or business challenges ahead of time to get Marvin thinking. This is a small group session with limited space. Come on out to our office and have coffee and conversation with Marvin! He'll be ready and waiting to chat with you every 4th Friday at 9:00 AM.